At a rest stop in the town of Medicine Hat (I know), en route to Calgary, I luncheoned out of doors since the weather was inexplicably hot. It got me thinking how there is still so much time to dress in pastels and bright colors, namely green. I find it’s an on-the-fence type of color, often overlooked, bar the obvious March 17th celebration when the majority of the human race dig deep into the depths of its wardrobe for green remnants. While we squeeze the last bit of warmth out from what’s left of the Autumn, wear your greens and wear them loud. Above: Cara Delevingne in Cacharel’s 1920 style dress at the Grand Palais circa 2012 SS Fashion Week. 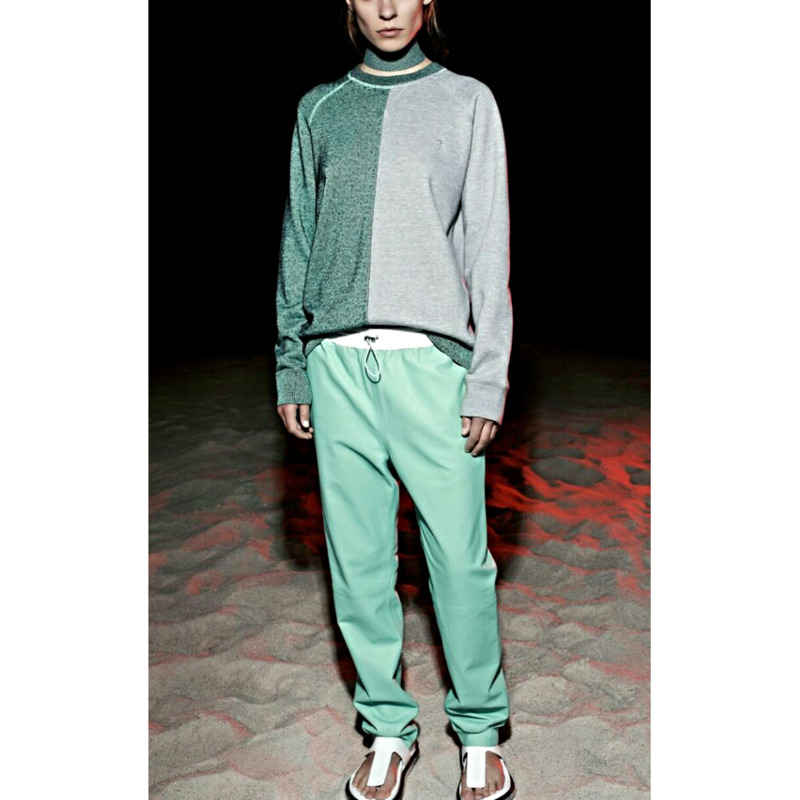 Above: T by Alexander Wang, Resort 2015. Salvatore Ferragamo echos this in his AW 2015 collection. 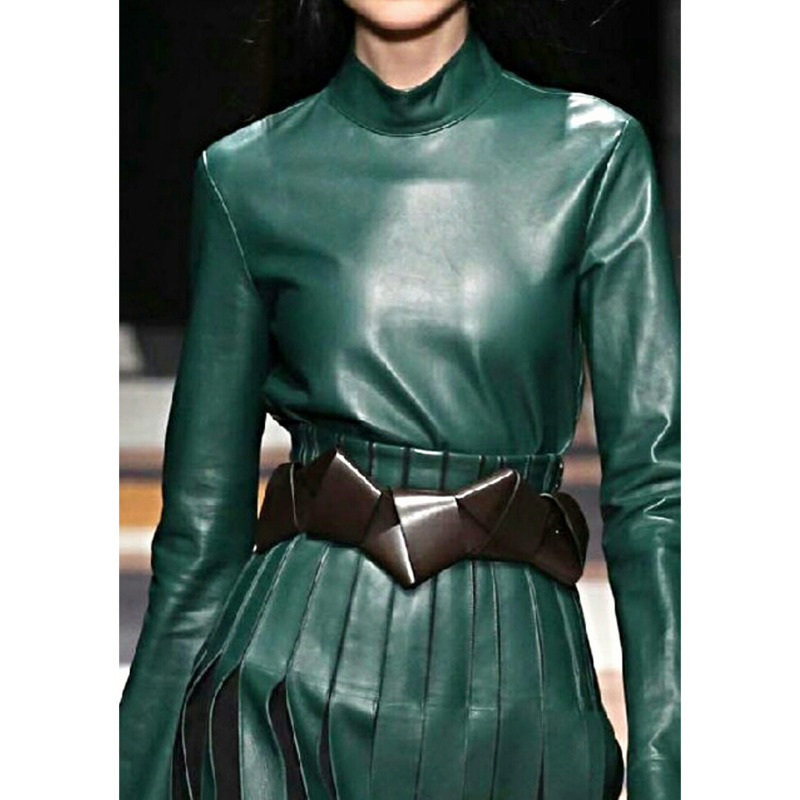 Bottle green leather pleated skirt and top with knotted belt. Check. Just so the active don’t feel left out this week I have included a rocking pair of retro roller skates. Another snippet of proof how green as stood the test of time. Don’t they scream white picket fence in a Californian suburbia setting? How very Wonder Years. Just to throw it in for the wow factor and for those who can dig their pockets deep, cast an eye below on Céline’s tote leather and pair with Christian Louboutin’s high heel pumps. Put ’em on and you’ll be in Kansas in no time. If you’re not feeling quite so generous to yourself why not go with an Alilovesyou Bag. Made in Spain and retailing at €620. Top handles are all the rage so you’re certain to be in trend. Here are just a few examples of how playful you can be with colors in your outfit especially when it comes to green. Not so cool and discouraging to wear like we once thought but rather soothing and easy on the eye. Pair with scuba, classic blue or even aquamarine to compliment it. Keep the luck of the Irish with you.